Open Auditions for this role only will be held at James Lee Community Center on Tuesday July 15th beginning at 6:45 PM in the theater. Auditions will consist of cold readings from the script. We anticipate being completed by 8:30 PM but that will depend on how many audtioners we have. The Providence Players of Fairfax is a non-profit, award winning, community theater troupe. All participation is on a volunteer, non-compensated basis. Please also review the rest of the original audition announcement below for important additional information about the production and the audition process. If you have questions about the role, please email the show’s Director, John Coscia at jjcoscia@gmail.com or phone him on his cell at 703-929-6745. Please note that all other roles have been cast and we will only be auditioning for the role of Crooks on July 15th. The proud, bitter, and somewhat cynical black stable-hand, Crooks gets his name, it is indicated in the script, from his crooked back. He lives by himself and is largely shunned by the other ranch hands – and he actively shuns them back, regarding any offers of kindness with suspicion. This bitterness stems from a combination of loneliness and the extremely pervasive, casual prejudices held by the country at the time this story takes place. Crooks is bookish and likes to keep his room neat, but he has been so beaten down by loneliness and prejudicial treatment of that he is now suspicious of any kindness he receives. Lennie’s brief interaction with Crooks reveals the complexity of racial prejudice in the northern California ranch life. Though Crooks was born in California (not like many Southern blacks who had migrated, he implies), he is still always made to feel like an outsider, even in his home state. Crooks is painfully aware that his skin color is all that keeps him separate in this culture. This outsider status causes him to lament his loneliness, but he also delights in seeing the loneliness of others, perhaps because misery loves company. He does take somewhat of a shine to Lennie eventually, and though he is doubtful of empty dreams, he too asks if he can join them and hoe the garden. One of Steinbeck’s most acclaimed works, this American classic chronicles four days in the lives of migrant workers, George and Lennie. Unlikely friends, they move from town to town hoping to work and save enough to own their own piece of land. But Lennie stirs up trouble, and George must choose between his friend and his dream. This vivid picture of the Great Depression conveys a tale of friendship, loneliness and unfortunate circumstances for even “the best laid schemes of mice and men.” Winner of Best Play by the New York Drama Critic’s Circle. PLEASE RSVP to providenceplayers@cox.net with the dates you plan on auditioning. HOW WE WORK: You are encouraged to plan to come to auditions on more than one of the audition evenings. This is not a requirement. Most PPF auditions have actors up and down to read multiple times in multiple combinations and scenes. Most actors find this fun. As space allows, you will be able to watch all the auditions. You may be asked to go into the hallway with audition partners and work a bit on a scene. We will do our best to get you up multiple times reading for parts you are interested in. You will also be asked to read for other parts you may not be auditioning for. The Providence Players strives to make our productions open to interested and engaged actors & actresses, regardless of their level of experience. We try and make our auditions as relaxing and fun as possible. AUDITION FORM: Resumes and headshots will be accepted, but are not required. 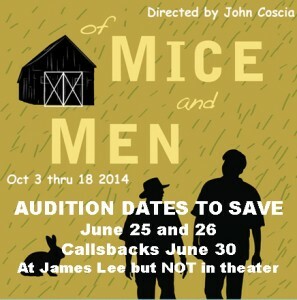 Please ALSO COMPLETE the attached PPF Of Mice and Men Audition Form and bring it with you to the audition. A copy of the preliminary production schedule is included with this announcement and will be available online and at auditions. Stage rehearsals begin September 2, 2014. In addition to the stage rehearsal schedule, additional full cast readings of the play and some selected scene study and character work will scheduled based on actor availability in July and August prior to the stage schedule. The schedule for these will be finalized a week or two after auditions. Unless indicated otherwise, all rehearsals will happen at the James Lee Community Center. Rehearsals will be held in the evenings roughly from 6:30/6:45 to 9:45 pm and on Saturdays and Sundays as indicated. Please come to auditions prepared to list any availability conflicts over this time period. Notes on age: all of the character’s ages indicated below are as Steinbeck has written them, but they should not be considered set in stone. Actors should examine and try out for roles in which theyfeel they can successfully portray the character, regardless of the age noted. Meaning if you are 25 and think you can pull off 50, by all means give it a shot! This goes both ways as well – if you are older, feel free to give a younger role a shot. Director John Coscia will ultimately decide on the best age range and mix for characters based on the needs of the play and the actors who audition so assume some flexibility from the listed age ranges. Characters are listed in order of appearance. Also, please be aware that this play is notable for its particularly offensive language and prejudicial opinions held by the characters regarding people of color. The complex history of racism in Northern California and the country at large is a persistent topic of analysis, discussion, and occasionally censorship with this play. Rather than passively and unthinkingly accepting the words on the page, we choose to view this facet of the play as a deliberate choice of Steinbeck’s to represent a time and place in our country, and as a chance for us as actors to reflect on these offensive views through the more-informed lens of the present day. Setting: Farm and ranch land in an unnamed Northern Californian valley. 1930s. A small, quick-witted man who is Lennie’s de facto guardian, traveling companion, fellow ranch hand, and best friend. Although he frequently complains about his caretaking responsibilities, he is obviously devoted to and protective of Lennie. This friendship is what helps sustain George’s dreams of a better future – a fantasy of a little piece of farmland to call their own. George has a tendency to posture around others. He and Lennie are perennially out of work and down on their luck, but they take on these trials together. A physically imposing, lumbering, and occasionally clumsy childlike man, also a migrant worker along with his friend and companion George. His mental disability means that he is almost entirely reliant upon George for guidance and protection, however Lennie looks up to his pal with a combination of awe, respect, and love. The two men share a vision of a farm they will own together, a vision that Lennie believes to the bottom of his heart. He is gentle and kind, but he has no conception of his own strength, which gets him into trouble. An aging ranch handyman, Candy lost his hand in an accident some time ago. He worries about his future on the ranch and fears the arrival of the day when his age will make him useless to others. When he hears of George’s description of their dream farm, he offers a considerable amount of money to join their venture, if only they would include him in the plans. Candy has an ancient dog he loves dearly (will be portrayed by an actual dog on stage). The Boss is a stocky and well-dressed man in charge of the ranch George and Lennie land at. He is also Curley’s father. He is stern but fair-minded employer – an anecdote from Candy says the Boss gifted a gallon of whiskey to the ranch hands one Christmas. He makes only one appearance on stage. The Boss’ son: a young, impetuous, and combative character. Curley indicates he “has done quite a bit in the ring” at one time, but now is just “a little guy, alla time pickin’ scraps with big guys.” He obviously has several chips on his shoulder, many of them regarding his newly acquired wife of two weeks and the way the other ranch hands look at her. His jealousy and frequent losses of temper serve to accentuate his essential pettiness – and his inadequacies..
Only known throughout the whole play by her relationship to her new husband Curley and a string of unpleasant epithets from the ranch hands, she is a victim of time and place. Young, pretty, and isolated as the only woman in the play, she is, like many of the ranch hands, desperately lonely and has broken dreams of a different life. She is a victim in many ways, and her preoccupation with her looks gets her – and Lennie – into trouble. The consummate ranch hand and the main driver of the mule team, Slim is called the “prince of the ranch.” And for good reason – he is tall, good looking, strong, and greatly respected by the other characters for his physical abilities around the ranch as well as his treatment of the other workers. He keeps his mouth shut unless it is to speak for the weak. He is an insightful, kind, and a natural leader – and the only other character who seems to intuit the nature of the bond between George and Lennie. Another one of the ranch hands, he is a thick-bodied man who constantly complains about the smell 0f Candy’s old dog. Carlson is a simple man who enjoy simple pleasures, but he has little sympathy for Candy when convinces him to let him take the dog out back and shoot it. Another one of the ranch hands, noted as a youngish laborer. He is amiable and good-natured, but a bit of a pushover. He and Carlson are in company together for much of the play, though when it comes down to it he is the only one who takes Candy’s side over the killing of the dog – but only for a moment before resigning himself to the group’s will. The proud, bitter, and somewhat cynical black stable-hand, Crooks gets his name, it is indicated in the script, from his crooked back. He lives by himself and is largely shunned by the other ranch hands – and he actively shuns them back, regarding any offers of kindness with suspicion. This bitterness stems from a combination of loneliness and the extremely pervasive, casual prejudices held by the country at the time this story takes place. He does take somewhat of a shine to Lennie eventually, and though he is doubtful of empty dreams, he too asks if he can join them and hoe the garden.